Photo © 2009 D. Sandeen, licensed to About.com, Inc. This is a finished two strand twist hairstyle. It was created on freshly washed and conditioned natural hair without extensions. Before beginning to twist, damp hair was prepped with Carol's Daughter Khoret Amen Hair Oil and allowed to air dry about 90%. A common question newbies have is "Should you twist on wet or dry hair?" The answer is really up to you and may require experimentation on wet, damp, nearly dry and completely dry hair. You'll find that you get various results depending on what you start with. It's up to you to choose the size of each twist section; just make sure they're as uniform as possible. While a rat-tail comb is useful for creating nice, even parts, you may find using your fingers to make parts easier once you get used to this method. These parts don't need to be exact, but if you want to make them very neat around the front of your head, pull the comb out then. Finger comb each individual twist section before twisting, while also using a holding agent. Here, we're working Organic Root Stimulator Lock & Twist Gel through each section to provide a light, non-sticky hold. Divide the section of hair into two parts. Try to make them as even as possible. If they're not even all the way down, you may run out of hair on one section and have to borrow from the other section. To begin a twist, simply twist each section of hair around the other. You can do this in a hand-over-hand movement, but as you get proficient, you won't need to move your hands as much; you'll find you can twist just by moving your fingers to twist the hair. Continue working your way down the section of hair, twisting in the same direction. This may differ depending on whether you're right-handed or left-handed. You don't have to twist each section going the same direction, however; when you work near your hairline, you may want to direct the twists back, in which case you should twist away from your face. If you want your twists to fall to the front, twist them toward your face. Try to maintain an even tension as you twist the hair. 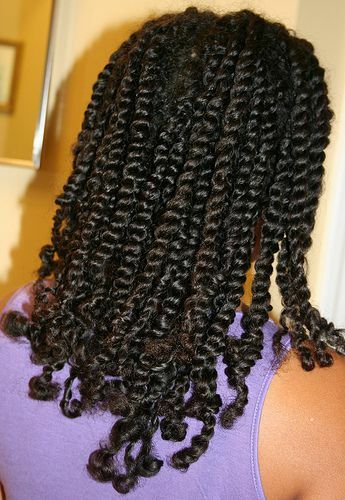 That makes the difference between twists that will hold easily vs. twists that easily unravel or look uneven. This may take practice, so don't worry if your tension isn't right the first time. Work all the way to the ends of the hair. You can put a dab of oil and/or a holding agent on the ends for additional hold -- this will help if your ends are very dry. When you reach the end, hold the ends firmly between two fingers and gradually release the pressure so that the twist will loosen and settle on its own. Depending on your tension and whether your hair was wet or dry when you began to twist, your twists may be skinny or more puffy. One of the reasons the two strand twist style works better on natural hair than relaxed hair is that curly or coily ends will hold themselves in place without much help (if any). With straight hair, the ends will unravel because they don't have anything to "grip" onto. If your hair is relaxed, you can try twist extensions to see how you look in them and if you like the look. A finished two strand twist hairstyle. Twists can last anywhere from one to a few weeks. You can definitely shampoo them without having to undo them -- just concentrate on cleansing your scalp and don't manipulate the twists too much. Twists will probably puff up as they age and there's nothing wrong with that. 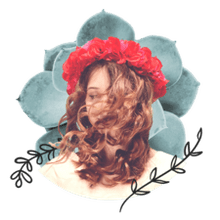 You may find a few needing re-twisting here and there, but they should hold up as an overall style that's protective, low maintenance and low-manipulation. Besides this simple and basic loose style, twists lend themselves to several other variations, including ponytails, twist out and updos, so once you master making your twists, you can create many other hairstyles from the same set. You'll Twist & Shout Over CURLS Blueberry Bliss Twist-N-Shout Cream! ORS Lock & Twist Gel Works on Locs, Twists, Braids & More!